Visible Logic, the design and branding firm behind Mail on the Mark, has worked with New England Clean Energy on many elements of their brand identity. 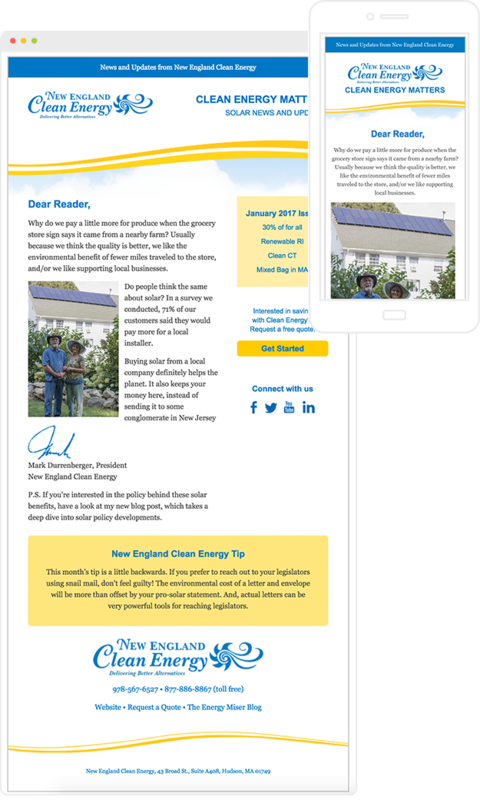 Their email marketing system continues their brand identity system including their blue & yellow color palette, cloud background and wavy yellow solar bands. Your newsletter content changes based on the information you’re sharing. But we ensure that even when there are changes, it should have a consistent and predictable look for your readers. We’ll link your Google Analytics to your e-newsletter and you’ll be able to see how your emails drive traffic to your site. Your e-newsletter referrals will be clearly visible in your Google Analytics account dashboard. Before you hit send, you can send unlimited previews to see exactly how your newsletter will look on various devices.